Have you ever had an itch on your scalp that you simply could not control? You may be scratching your head while reading this article. At some point, we have all experienced an itchy scalp and blamed it on dryness or dandruff. Before you reach for a shampoo treatment, you may want to find out what is causing the itch and learn how to get rid of itchy scalp naturally. An itchy scalp may be just that, a brief discomfort. It also may be caused by a serious health condition or a medication. You may experience the itch alone or it may be accompanied by spots of swelling, redness, or even damaged strands of hair that could lead to baldness. To treat the continuous itchiness on your scalp and prevent it from reoccurring, it is important to pinpoint the cause. It may be the result of your current hair cleansing products, prescribed or over-the-counter medications, an allergic reaction to certain foods, or a symptom of an underlying disease or disorder. The more well-known and common cause of an itchy scalp is dandruff, a form of seborrheic dermatitis. This is seen in babies as cradle cap. Yeast on our skin feed off the oil secreted by our hair follicles. An excess of yeast can cause issues such as inflammation of the skin. Dandruff presents with itchy and flaking skin on the scalp while seborrheic dermatitis can be seen on any part of the body with the itching and flaky skin along with red inflamed patches. These conditions can be caused by emotional stress, poor nutrition, genetics, and abnormal immune system functioning. Lice’s association with dirty or unwashed hair is simply a myth. Lice thrive on healthy, clean hair. This highly contagious condition occurs when the little creatures latch on the hair follicle with strength that can only be weakened by getting rid of the lice and the eggs they leave behind. 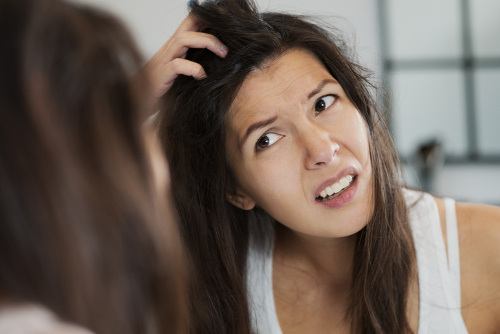 Your strands of hair could have lice weeks before you experience an itchy scalp, ears, or neck. At first glance, you may think it is dandruff. If you have an itchy scalp, your diet or shampoo could be triggering an allergic reaction. Many foods can stimulate inflammation and fungal infections such as soy products, peanuts, and sugar. Avoiding these food products may help in determining whether your diet is causing the itchiness. You could also test whether it is your shampoo by switching to another brand to see if the symptoms stop. Of all of the various shampoos and conditioners on the market, many contain chemicals that could be causing your body to have an allergic reaction. An autoimmune disease, psoriasis can appear as red, scaly, raised patches on the scalp and other skin parts of the body. An official cause of psoriasis is not known, but the condition has been linked to hereditary genes in some studies. Treatments are available to alleviate some psoriasis symptoms. This fungal infection is also known as tinea capitis and can be spread on contact. Targeting the scalp, this condition presents as round hair loss patches, a raised rash with redness surrounding it, and black spots outlining the area. It can occur with scalp injuries or scrapes and time periods of having unwashed hair or wet skin. Many people turn to a popular brand of shampoo to relieve their itch, but there are several natural remedies for itchy scalp you can find at home. Tea tree oil is used to prevent lice infestations in the public school system, but its antifungal, antibacterial, and anti-inflammatory properties may also be very useful in treating an itchy scalp. Add 10 to 20 drops to a one-half cup of gentle baby shampoo and use daily until condition improves. You can also rub your scalp with one tablespoon of vegetable oil and two or three drops of tea tree oil daily for one week. A common household product, baking soda, is another fantastic home remedy to help relieve symptoms of itchiness and control dandruff by battling excess fungi on the scalp. Combine water with the baking soda and apply the paste directly on scalp. You may want to cover head in olive oil before treatment. Leave paste for 10 to 15 minutes before rinsing. Eliminate itchy scalp and reduce inflammation, flakes, and dandruff with a banana. Massage a mixture of two mashed bananas and one avocado onto your scalp for a 30-minute treatment before rinsing. Bananas also work to condition your hair. The antiseptic properties of lemon and lemon juice may relieve the itchy symptom and get rid of dandruff. To combat dandruff, massage lemon juice directly on the head and leave for five minutes before washing hair. To deal with itchiness, do the same treatment but add water to the lemon juice. You can also add lemon juice to yogurt to use as a pre-wash treatment. To match our natural production of oil as closely as possible, use the moisturizing agents of jojoba oil. Before bedtime, apply jojoba oil to scalp for an overnight treatment. Remove in the morning with a hair wash. Repeat each week. The antiseptic properties that battle fungi and bacteria in your mouth may also be useful for curbing the yeast and fungal infections associated with dandruff on the scalp. Try rinsing your hair with an alcohol-based mouthwash after shampooing. Follow up with a conditioner as normal. To treat the symptoms of itch and any dryness of scalp, use apple cider vinegar and its powerful pH balancing properties. It also contains anti-inflammatory elements that may eliminate the yeast and virus that stimulates the itch symptom. 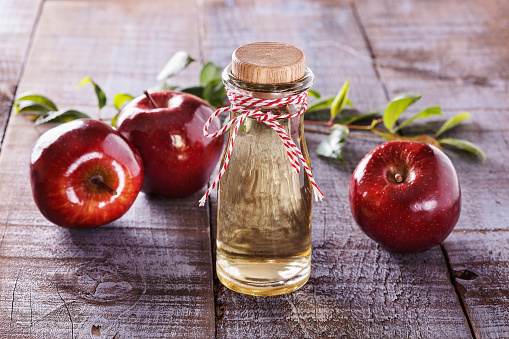 Combine equal parts of water and apple cider vinegar in a spray bottle and apply to clean, naturally dried hair. Remove with shampoo after a few minutes. Repeat once or twice a week until symptoms clear. Used for centuries to moisturize skin, aloe vera is an easily accessible natural remedy for dry scalp. You can use the gel from a fresh aloe vera plant or purchase a tube at your local pharmacy. Apply directly to the scalp before washing hair. Medicated dandruff shampoos and aspirin tablets have one powerful ingredient in common: salicylic acid. You can reduce the flakes by adding two crushed aspirins to your regular shampoo whenever you wash your hair. Let the blend sit for 2 minutes before rinsing. An itchy scalp does not need to ruin a special date or give a less favorable impression to others. You can treat the itch and dryness associated with many scalp issues with products found in your home. As an itchy scalp, can be caused by an underlying health condition or lead to other health concerns if not treated, it is important to seek medical advice if symptoms do not clear up or subside with these home remedies. “Home Remedies for Itchy Scalp,” Top 10 Home Remedies; http://www.top10homeremedies.com/home-remedies/top-10-home-remedies-for-itchy-scalp.html, last accessed February 21, 2017. Jung, A., “How to Get Rid of Dandruff: 11 Natural Treatments,” Reader’s Digest; http://www.rd.com/health/beauty/dandruff-natural-treatment/, last accessed February 21, 2017.